On May 3, representatives from the Maryland Historic Trust (MHT), the Federal Highway Administration (FHWA) and the Delaware Department of Transportation (DelDOT) visited the Warwick Site. Planned improvements to Route 301 led to the excavation of the site, and, in turn, to coordination with various state and federal agencies. Near the Warwick Site, Route 301 narrows from a two-lane road in Maryland to one lane in Delaware; therefore, DelDOT’s road widening will extend a short distance into Maryland to avoid creating a bottleneck near the state line. Coordination with both states was required to ensure the work meets the requirements of both state agencies, as well as the FHWA. 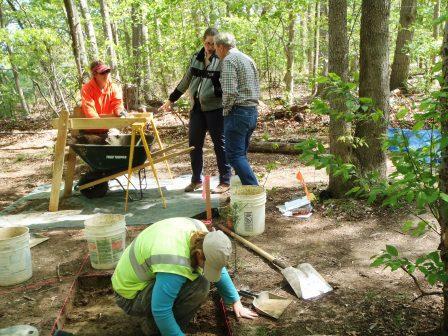 Since excavation destroys the archaeological record at the same time information is collected, meeting with representatives on site allowed the participants to examine the ongoing work directly rather than filtered through Dovetail’s documentation and interpretation. At the meeting, DelDOT, thanked everyone for coming and turned the meeting over to Dovetail Cultural Resource Group (Dovetail) for an overview of the site. Mike Carmody of Dovetail presented an overview of the excavation strategy, and discussed public outreach. 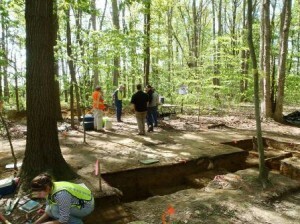 Mike Klein, Dovetail archaeologist, then described the specific results of the excavation, including an overview of the vertical and horizontal distribution of artifacts, the type of artifacts recovered, and the approach to excavation. Conversation with the agency representatives clarified aspects of the excavation and the ongoing research and analysis. The meeting concluded with FHWA and MHT staff engaging the Dovetail field crew, who continued the fieldwork throughout the meeting.